Restore your smile and visit our dentists in Toluca. They’ll look after your teeth and you’ll find plenty to do in the city your between dental appointments. Toluca de Lerdo (to give its full name) is the capital city of Mexico State and it has so much culture to offer that you’ll have to plan your visit well if you’re going to get round to seeing most of its attractions. Second only to Mexico City in the number of museums it has, it is an architecturally beautiful city with buildings stretching back centuries, providing a contrast to its modern, industrial image. 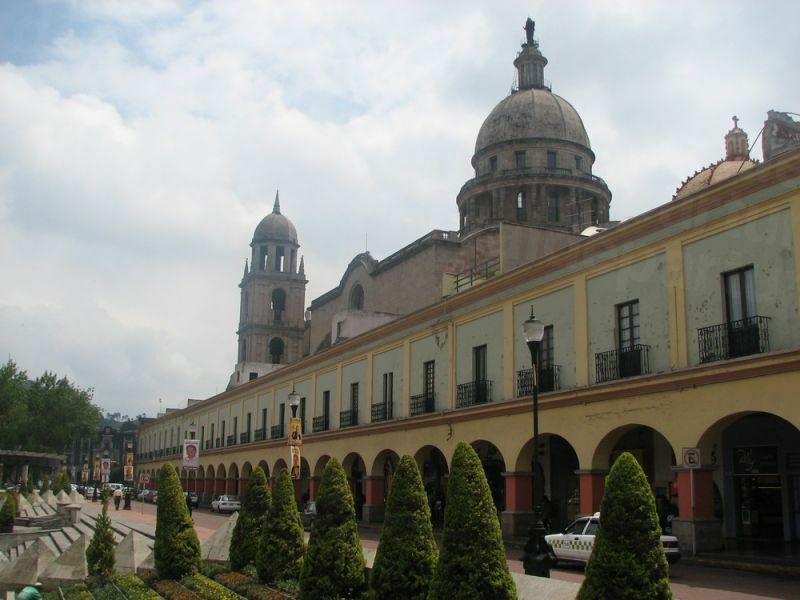 The town center or Zocalo is also known as the Plaza del los Martires (Plaza of the Martyrs), and includes the Justice Place and the Palace of the State Government. Among the narrow streets and the historic center, imposing architecture transports you to bygone centuries – a stark contrast to the modern, industrial image of the city. The old market has been transformed into a botanical garden. 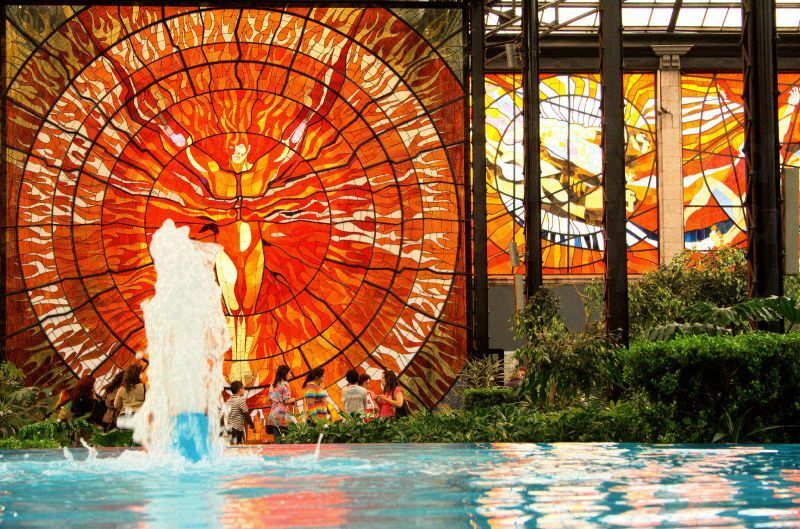 The Cosmovitral is not just a garden, but the old market building has been covered with glass wall and ceiling panels, designed by the artist Leopoldo Valdes, depicting the relationship between man and the cosmos. Part garden, part installation it is a fascinating and relaxing space to spend some time in the center of the city. Toluca’s cathedral was begin in 1867 and is a mix of styles representing the various stages in which it was remodeled and built. It shares design elements with Mexico City’s cathedral and contains impressive stained glass windows, balustrades and balconied areas, topped with a dome. Two official orchestras – the State (Orquesta Sinfonica del Estado de Mexico) and the Municipal one – both reside in Toluca. There is also the Eagles of Anahuac – a youth marching band, which was formed around 35 years ago and was the first in the country. You will find no shortage of things to do in the city center, but the municipality is surrounded by forests and just a short journey out of the city you will find yourself in verdant countryside, which offers visitors with plenty of outdoor pursuits to blow away the city cobwebs. Toluca is the capital of the State of Mexico. It’s around 40 miles west of Mexico City and is in the east-central part of the state. Why visit a dentist in Toluca? Toluca is a pretty, historic city with a myriad of things to do both indoors and outdoors. Temperature-wise, its high altitude makes it one of Mexico’s coolest cities, and in winter it is even chilly. For sight-seeing it is much pleasanter not to be sweltering under the sun and Toluca will appeal to those who prefer a little less heat. While Toluca is an old city its amenities are modern. As you would expect, tourist, medical and dental facilities are as up-to-date as anywhere in the world. Our dental clinics are equipped with state-of-the-art technology to bring you dental treatment that is world-class – and the bonus is that, on average, you can save around 70% compared to prices back home. From internationally-known chain hotels to boutique, Toluca offers countless accommodation choices. Treat yourself to 5* luxury in an ornate hotel set in luxury gardens for less than $100 a night per room; or choose a budget option at less than $30 a night. Yes - there are no travel warnings from the US governmental advisory on travel to Toluca. Yes – there is no reason at all why your dental care in Toluca shouldn’t be as good, if not better, than you would get at home – but it is about choosing your dentist with care. Finding a dentist with Dental Departures means that we have already done the background work for you – so you know you will be booking with a dentist who has met desirable standards. We do legal and criminal checks, as well as dentist qualifications and for all our verified clinics we visit them personally. We present as much information as we can on our website, which includes dentist qualifications, high resolution clinic photographs, virtual tours and real patient reviews which is freely available for everyone to see. We know it’s difficult, if not impossible, to check out a dentist abroad before you go, so we provide a look before you book service so you can make up your own mind who is the best dentist for your requirements. Historically, dental care in Mexico has had something of a bad reputation (and for good reason, in some cases!) but you will find that modern dentists, especially those that treat international patients, are just as well qualified as dentists in the US and Canada. The global market means that many dentists, once they have their general qualification, take extra training abroad – and you will see this is the case with a lot of our Mexican dentists who travel to the US for specialist qualifications. This also means that if they have successfully completed training in the US they are then eligible for American Dental Association membership, which then means that they must adhere to the same rules, regulations and procedures as American dentists. Our dentists all provide warranties and guarantees on the work they do, as well as the materials they use, and if there is a problem with your treatment, providing it is still under warranty, your dentist will fix it free-of-charge. Happily, it is a rare occurrence for any of our patients to experience any problems with their dental care, but no matter how good your treatment is, there is always the possibility that there will be complications, whereby you may need to travel back to your dentist overseas. In this situation, you may feel more at ease to take out low-cost insurance before you travel so that should you need to go back then your travel and accommodation costs will be provided for. We’re sure you’ll feel that paying a small price up front for this additional peace-of-mind is a small price to pay. Our dental clinics have English-speaking staff and so you will be able to get by without any Spanish. You will find that hotels (especially the international chain hotels) having English speaking staff too. Our website lists the individual payment methods accepted by our dentists in Toluca. All accept US cash, and other methods include bank transfers, personal/traveler checks and debit/credit cards. Credit card payments may be subject to an additional processing fee, usually between 3-4%. Our dentists in Toluca are not usually able to accept your US or Canadian dental insurance. But, if your insurance provider allows for ‘out-of-network’ care you may be able to claim back the cost of your treatment when you get home. If this is the case, your money will certainly go a lot further in Toluca. Phone your insurance provider to ask, and make sure you get the appropriate forms and paperwork from them before you travel if they do. When is the best time to visit one of our dentists in Toluca? Our dentists in Toluca are open throughout the year and so the best time to go is whenever is convenient to you. Just remember that winter nights are cold and the temperature may drop below freezing so make sure you bring some warm clothing. The new, modern hotels are mainly wheelchair accessible and certain parts of the city are, but narrow streets, cobblestones and lack of sidewalks in other areas of the city make it difficult to navigate in a wheelchair. Getting to and from our dentists should be reasonably easy as many of our dentists offer pick-up and drop-off services, and the clinics are wheelchair-friendly. If you’re unsure, get in touch with us to discuss your requirements – we can always find a way of getting you to one of our dentists. Dental patients should be aware that sedation dentistry is not practiced as standard in Mexico – local anesthetic being the pain relief method of choice. If you do need sedation then most of our dentists are usually happy to arrange this, but you will need to book it in advance as they will have to enlist the services of an anesthesiologist. This will also incur additional fees of between $400-$600. You will also need to book prescription anxiety medication, such as Valium, in advance too. What else is there in Toluca? Zoo Zacango is one of the biggest in Latin America and is one of Toluca’s biggest attractions. It located to the south of the city in the town of Calimaya and houses 500 animals in natural surroundings that integrates an old hacienda with Mexican architecture. Ixtapan de la Sal is less than an hour’s drive south of the city and as well as being a pretty city with a main avenue lined with Jacaranda trees, cobbled streets and red-roofed houses, it is a must for water-babes. The municipal spa in the center of town features thermal waters and whirlpools and visitors can indulge in mud baths, mud masks or massages from trained therapists and masseurs. Total relaxation and rejuvenation. Also here is the largest water park in Latin America – the Ixtapan Water Park. It too, features thermal waters in Roman tubs but additionally has wave pools, slides, an aquatic mountain – and even rowing and motor boats. From Toluca it is reasonably easy to access ecotourist pursuits and outdoor activities in the vast forested areas surrounding the city. Camping is popular, as are extreme sports, including mountain climbing and mountain biking. There are a number of parks with stunning views and activities to suit all – the nearest to the city being Alameda Park 2000 on Avenida Las Torres. Further afield, around 30 miles away, is the National Park of Nevado de Toluca which offers camping, a lodge, security and various trails for hiking and biking. 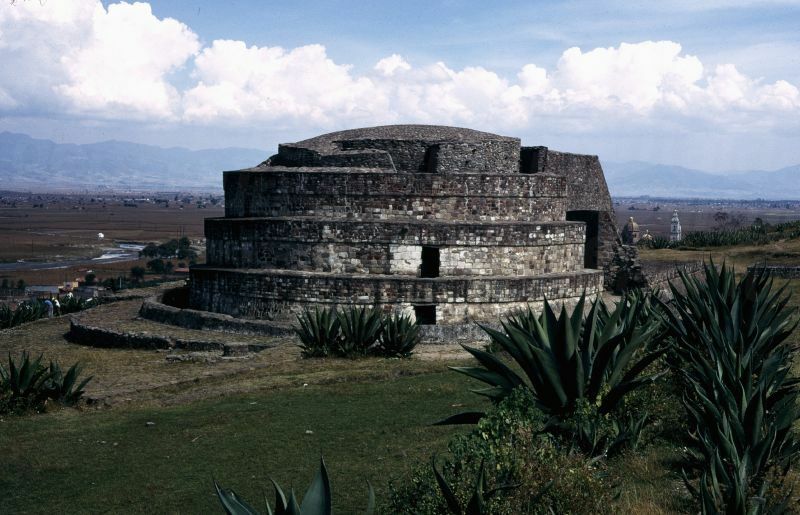 There are plenty of archaeological sites around the State of Mexico too with ruins of pre-Hispanic settlements, such as Teotihuacana, Toltecas and Matlazincas. The nearest is Calixtlahuaca, around 6 miles northeast of Toluca, on Highway 55. The nearest international airport is Licenciado Adolfo López Mateos International Airport in Toluca which mainly serves low cost carriers, but does include international flights from some US cities, including Houston, Las Vegas and Dallas. Otherwise, Mexico City’s Benito Juarez International airport is only around 40 miles away. Book an appointment securely and easily online with Dental Departures. Alternatively, we are available practically 24/7 via our toll free phone number or our online chat facility. We can help you find a quality-checked dentist in Toluca at the best price available – guaranteed.